Citation: C N Trueman "Prisoners of War"
Prisoners of war are a product of any war. By the end of World War Two, hundreds of thousands of soldiers, airman and sailors had been held as prisoners of war in all the theatres of war – Western Europe, Eastern Europe, the Far East, Asia and North Africa. There were rules that governed the treatment of prisoners of war (the Geneva Convention) – though a document formulated in Switzerland in times of world peace was always going to be hard pushed to be accepted by all those involved in World War Two. However, on the Eastern Front, a completely different picture emerged. After the success of ‘Operation Barbarossa‘, Germany captured vast numbers of men from the Red Army. Fitting in with Hitler’s view of racial superiority – and racial inferiority – these men were at best treated with indifference and at worst, with sheer brutality. Many died as slave labourers and some ended up in the death camps – Russian POW’s were involved in the break-out from Sobibor. Those that did survive then had to face accusations in post-warRussia that they, somehow, had been collaborators; how else would they explain their survival? German POW’s captured by the Russians faced similar prospects. Few of the 91,000 Germans captured at the end of the Battle of Stalingrad ever returned to Germany after the war. Those captured in the later stages of the war were sent to Russia and made to carry out heavy labour in prison camps dotted about the USSR. The rules of the Geneva Convention barely existed on the Eastern Front.Nazi Germany attacked Poland on September 1st, 1939. At the same time, Soviet Russia attacked from the east. War In Europe ended on May 7th 1945, while VJ Day was celebrated on September 2nd, 1945. In the intervening years, millions of people had been involved in fighting in some capacity or another, with the expected consequence that many tens of thousands were taken prisoner and put into POW camps. The treatment of these men varied considerably. For a British POW in a German POW camp, life could be monotonous and strict. However, in camps run by the military, given the circumstances, life tended to be generally ‘fair’. The same was true for Germans and Italians held in British POW camps. There was an expectation that men would try to escape and if caught, those men knew that they would be suitably treated – usually within the rules of ‘the game’. There were exceptions to this when escaped prisoners were shot, but this was rare. If the Geneva Convention barely existed in Eastern Europe, it was not even recognised by the Japanese military which could not even understand why someone would want to shame their family and country by surrendering. Hence why the Japanese treated those who had surrendered to them with such barbarity – starting with their campaign in China in 1937. To a Japanese soldier, the greatest shame was to surrender – such a belief had been literally beaten in to all recruits. This belief in honouring your family and country also explains the thousands who volunteered to be kamikazes. Those Allied soldiers that did surrender to the Japanese went against what the Japanese perceived as honour. As an example, the Japanese took 100,000 men prisoner in Singapore. Many had just arrived and had not fired a bullet in anger. To the Japanese, these men did not deserve to be treated with any decency as they had shown no ‘honour’. 9,000 of these men died building the Burma-Thailand railway. 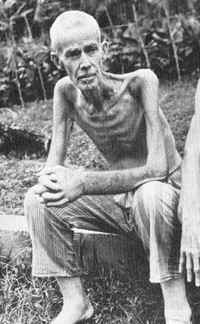 Many other POW’s from other Pacific battles died on the infamous Bataan death-march – those who could not make it, were bayoneted where they lay. Survivors of Japanese POW camps were invariably united in their tales of brutality in these camps – as shown in films such as ‘Bridge over the River Kwai’ – and what happened in these camps outraged western society. However, it is a myth that Japanese soldiers did not surrender. In the first few years of the Pacific War this was probably true. But as the war turned in favour of the Allies, this became less true and more and more Japanese soldiers became POW’s.